The Statue of the Free Woman at the entrance of Amude, 20 miles west of Qamishli, Syria. August 1, 2018. Image: Ivan Hasib/The Defense Post. 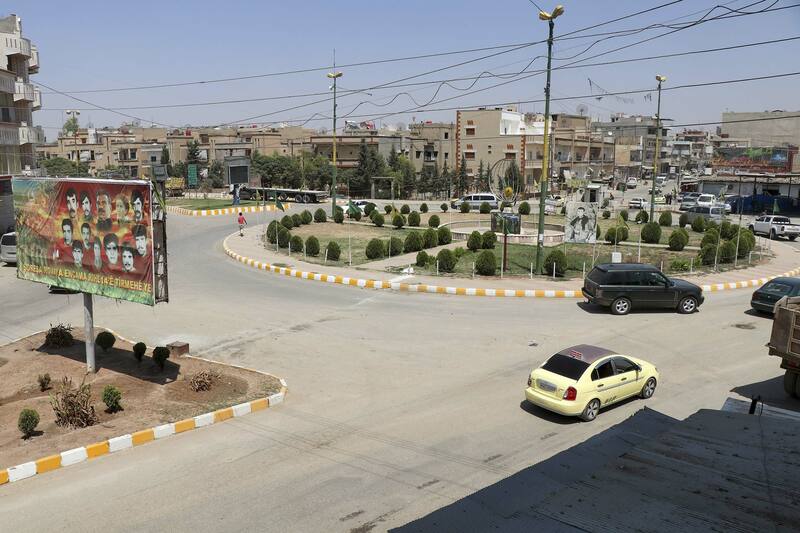 QAMISHLI, Syria – The Kurdish majority area in northeastern Syria is living in an anxious confusion nowadays. The population doesn’t know exactly what awaits them as Syria’s seven-year civil war appears to be winding down, with the regime of Syrian President Bashar Assad retaking territory from rebel groups, and Islamic State’s so-called caliphate near total collapse. The only hope people seemingly have at this point is the presence of American troops in the region. Since the international campaign against ISIS in Syria started in late 2014, the U.S. has deployed thousands of troops to advise the Kurdish-led Syrian Democratic Forces in its fight against the militants. Kurds have been instrumental in removing ISIS from most areas it once held, and Kurdish-led forces now control more than a quarter of Syria’s territory, making them the second-largest entity in the war-ravaged country after the Syrian regime. For the first time in decades the once-marginalized Syrian Kurds have been in charge of their region and their increasing power has allowed them to carve out a semi-autonomous region in Syria. The Martyrs Square in Qamishli, Syria, August 1, 2018. Image: Ivan Hasib/The Defense Post. The Democratic Union Party (PYD) – whose armed wing, the People’s Protection Units (YPG) is the dominant group in the SDF – began to administer the Kurdish region in July 2012 after Syrian regime troops withdrew to focus on fighting anti-government rebels elsewhere in the country. In January 2014, the PYD and affiliated parties declared a self-rule system in the area of northern Syria Kurds call Rojava (‘Western Kurdistan’ in Kurdish). The PYD-led administration which includes Arab and Christian Syriac parties announced the Democratic Federation of Northern Syria in March 2016. The DFNS includes areas captured from ISIS that are not part of Rojava. But despite territory gained as the SDF advanced on ISIS in Raqqa and other majority-Arab areas, Syrian Kurds still feel that their fate is largely dependent on whether the U.S. stays in Syria for the long term. While the Trump administration has repeatedly said that the U.S. mission in Syria would be over once ISIS has been eliminated, U.S. officials have recently changed their tone with regard to the American presence. 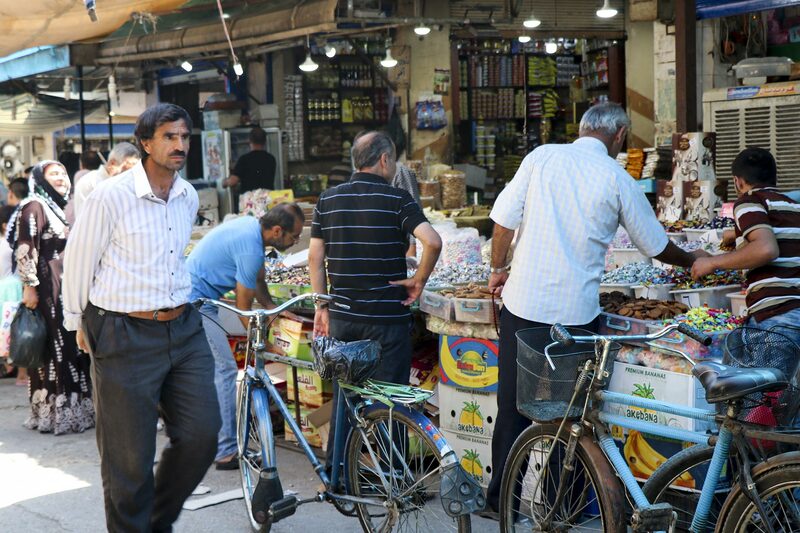 View of the main market in Qamishli, Syria, August 1, 2018. Image: Ivan Hasib/The Defense Post. In late August, National Security Adviser John Bolton said Iran-backed forces must leave Syria as a prerequisite for any peace deal in the country. This was seen by many observers as a hint that U.S. forces would possibly stay longer. “The Defense Department and State Department have long seen staying in Syria for the ‘Long Haul’ as necessary for leverage against Assad, helping the Kurds and rolling back Iran,” said Joshua Landis, director of the Center for Middle Eastern Studies at the University of Oklahoma. “President Trump has been the squeaky wheel. He surprised everyone by saying that he wanted to bring the troops home soon. This caused his national security community to do damage control and try to convince him to prolong the operation,” Landis told The Defense Post. 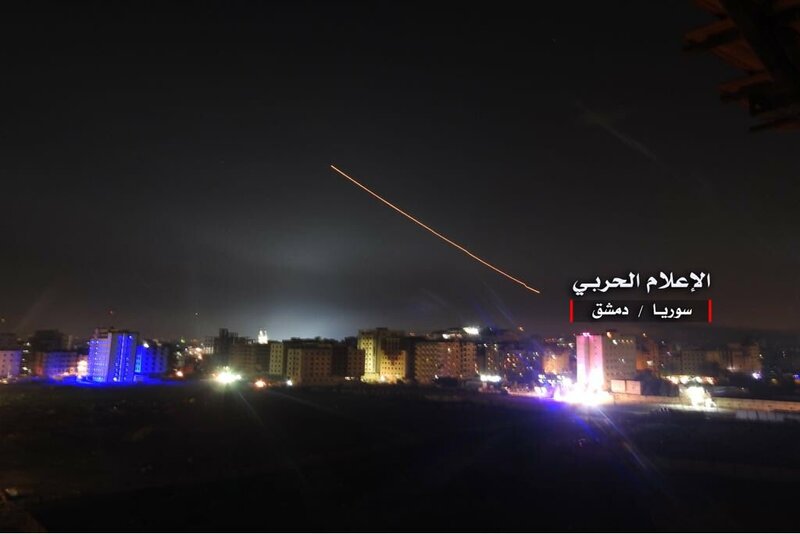 Since the eruption of Syria’s civil war in 2011, Iran – a staunch ally of Syrian regime – has become increasingly involved in the war-torn country where Iranian forces have built major military bases – something that has been concerning Israel, Syria’s neighbor to the southwest. In a recent trip to northern Syria, veteran U.S. diplomat William Roebuck reiterated his country’s commitment to defeat ISIS and curb Iran’s increasing influence in Syria. “We are prepared to stay here, as the president has made clear, to ensure the enduring defeat of ISIS. We remain focused on ensuring the withdrawal of Iranian forces and their proxies as well,” Roebuck said at a press conference in the town of Shaddadi, in southern Hasaka. Shaddadi was freed from ISIS in February 2016. The U.S. maintains around a dozen military bases of varying size in SDF-held northern and eastern Syria, some with runways capable of taking large transport aircraft. The role of U.S. military presence in a post-ISIS northern Syria was evident in the town of Manbij – an ISIS stronghold that was freed by the SDF in August 2016 – where the U.S.-backed Manbij Military Council (MMC) and Turkey-backed rebels came head to head. But a roadmap agreement for Manbij between the U.S. and Turkey in June helped avoid a conflict that could have a major impact on the stability of northern Syria. 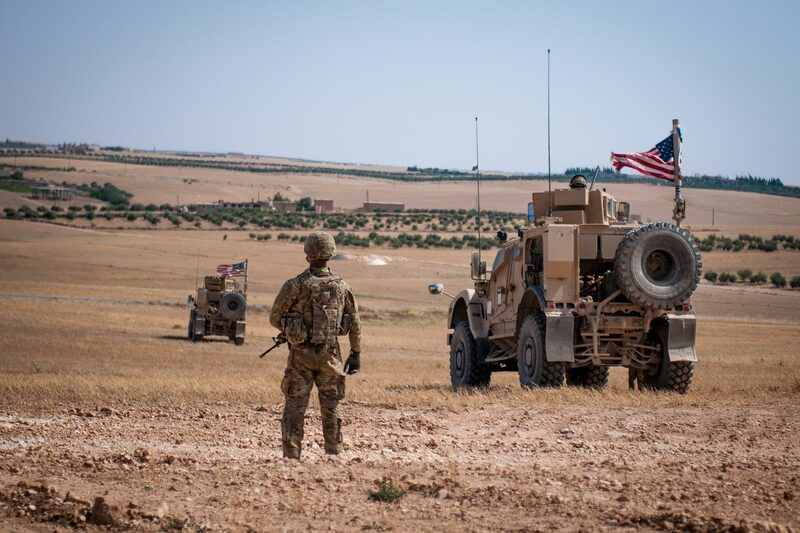 As part of the agreement, U.S. and Turkish forces have been conducting coordinated patrols in the vicinity of Manbij while the city is still under the control of the MMC. Other Kurdish groups that are opposed to the PYD have expressed concerns about a sudden American departure from their region, albeit for different reasons. “The U.S. relied on Kurdish forces to push out ISIS from most areas in eastern Syria, including non-Kurdish areas such as Raqqa and Deir Ezzor,” said Ibrahim Biro, a senior official with the Kurdish National Council in Syria (ENKS), which has the backing of the Kurdistan Regional Government in Iraq. “This has created a lot of ethnic sensitivities in between Kurds and Arabs. So if the Americans decide to leave, the Kurds will have enemies to face. But if they stay for a longer time, it would be in the best interest of every side that the U.S. push for a more pluralistic and democratic system of governance in northeast Syria, including areas in the eastern Euphrates,” Biro told The Defense Post. Local observers believe that while the ISIS’s physical threat to Syria is near gone, it is too early to talk about a complete elimination of the group and its ideology. 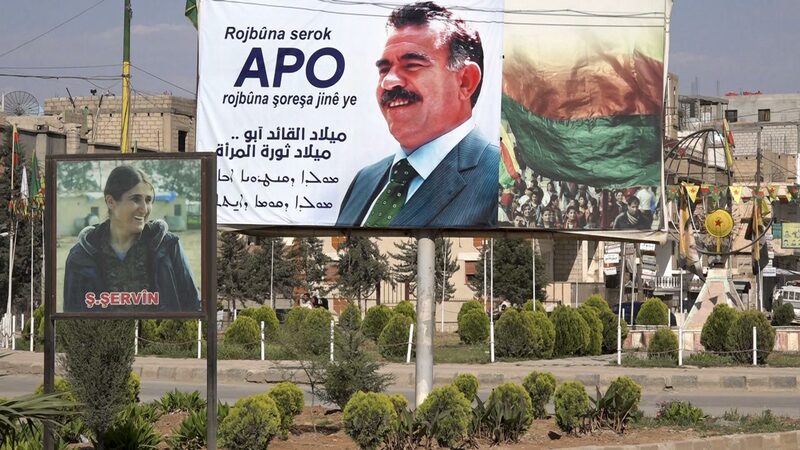 A poster of Abdullah Ocalan, the founder of the Kurdistan Workers’ Party (PKK), Qamishli, Syria, July 22, 2018. Image: Ivan Hasib/The Defense Post. “One the one hand, the U.S. administration has come to believe that the idea of eliminating ISIS completely is far from achieving now, because it rightfully fears that ISIS could reemerge in a different form,” Sadredeen Kinno, a Kurdish researcher who closely follows Islamist groups, told The Defense Post. “On the other hand, it has become clear that SDF alone can’t confront ISIS. It always needs a powerful backer as such the U.S. and thus the U.S. feels that it needs to stay in Syria longer,” he added. Local residents in the Kurdish heartland believe that having Americans on the ground could be a stabilizing factor for any future settlement in Syria. In mid-July, a senior DFNS delegation visited Damascus for talks with the Assad regime over the future of Rojava, including security and military matters. The talks have not had any results yet, but Kurdish leaders believe they could pave the way for broader negotiations to end the country’s deadly conflict. Residents, however, don’t want the situation to go back to how it was prior to 2012 and a U.S. presence for them is perhaps one guarantee to preserve the status quo.